The esoteric Italian wheel company Antera opened its doors in 1991, and set the aftermarket wheel world on fire with a slew of funky new-age designs. While most other companies were sticking with the tried and true, Antera’s goal was to create a shake up, and they sure did. With very of-the-era rounded spokes and oddball shapes, Antera soon became a household name in the business. The most famed iteration, the Type 109, is the three-spoke wonder you see here. The Type 109 was a fashion forward wheel design that found favor among hard parkers and car club fanatics alike. Antera even claims on their website that this wheel won an ‘Alloy Wheel Design of the Year’ award in 1994. Considering this design incorporated a center cap that not only hid the ugly lugs inside, but was also integral to the wheel’s design, that should come as no surprise. Additionally, there is no traditional Schrader valve on the outer wheel lip, as it is also hidden behind the center cap. One of the spokes has an integrated hollow pipe allowing air to flow from the center of the wheel into the tire. While Antera is still alive and kicking, producing a small sampling of really awful wheels, the Type 109 is sadly no longer. 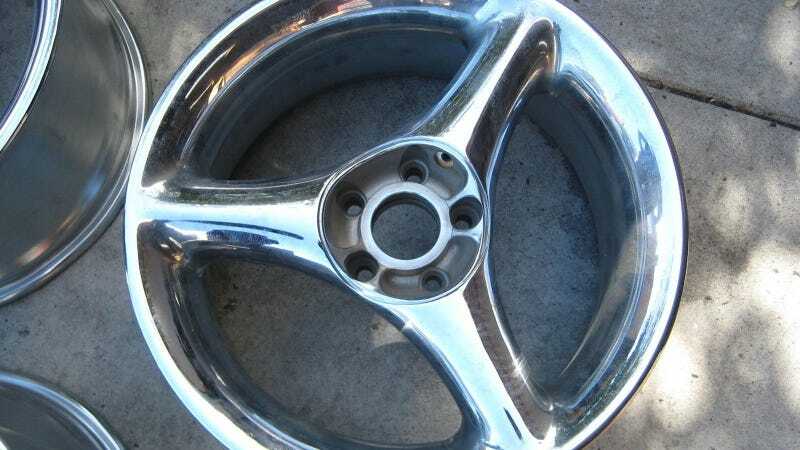 The wheel was available in a number of sizes (up to 10x18), offsets, and bolt patterns in the 1990s, and they are still occasionally found for sale on enthusiast forums and auction sites. They remain quite popular among the Volkswagen tuner crowds, having gone from genuinely cool through awful to ironically cool, and they’re slowly working back to genuinely cool again. With current trends in nostalgia heading toward the 80s and 90s, it won’t be long before Antera Type 109s are again the coolest wheel in the parking lot. If you aren’t happy about this, and are looking for someone to blame, pin it squarely on Radwood.